Christian de Duve, a cytologist-biochemist at the University of Louvain in Belgium, was using ultracentrifugation to separate and examine the contents of cells. In 1949, while exploring the action of insulin on liver cells, his focus was diverted by an unexpected observation. Prior to placing cells in the ultracentrifuge, he homogenized them with either a pestle or an electric blender and then added the enzyme acid phosphatase. To his surprise, only the cell fraction that was homogenized with the electric blender lost most of its enzyme activity. Further study in 1955 revealed the presence of a previously undiscovered intracellular organelle—one that had a sac-like structure surrounded by a membrane. The contents of this organelle had lytic properties (capable of breaking down tissues), and de Duve called the organelle lysosome. In collaboration with the electron microscopist Alex Novikoff, the presence of lysosomes was visually confirmed. De Duve never retuned to investigating insulin and liver cells but was a co-recipient of the 1974 Nobel Prize for his discovery of lysosomes. A CELLULAR DIGESTIVE SYSTEM. Lysosomes play an important role in health and disease. When functioning normally, their contents contain about fifty acid hydrolase enzymes that are capable of breaking down proteins, nucleic acids, carbohydrates, and fats. Whereas there are conflicting reports as to whether lysosomes are present in plants, they are in all animal cells, with greatest numbers in disease-fighting cells such as white blood cells. They serve as the digestive system of the cell, breaking down materials taken from outside the cell, such as viruses and bacteria, as well as playing a cellular housekeeping role within the cell, ridding it of excess and worn-out organelles. Lysosomes also play a role in protecting cells during periods of prolonged starvation. By the process of autophagy (“self-eating”), lysosomes can digest intracellular components, with their metabolites recycled to synthesize molecules that are essential for the cell’s survival. When lysosomes fail to degrade substances that are normally broken down, these substances may accumulate, causing cellular malfunctions and organ damage. There are approximately fifty of these rare genetic lysosomal storage diseases, which include Gaucher’s disease and Tay-Sachs disease. SEE ALSO: Metabolism (1614), The Liver and Glucose Metabolism (1856), Enzymes (1878), Insulin (1921), Inborn Errors of Metabolism (1924), Ribosomes (1955). In this image of the interior structure of a plant cell, lysosomes are depicted as small orange spheres. 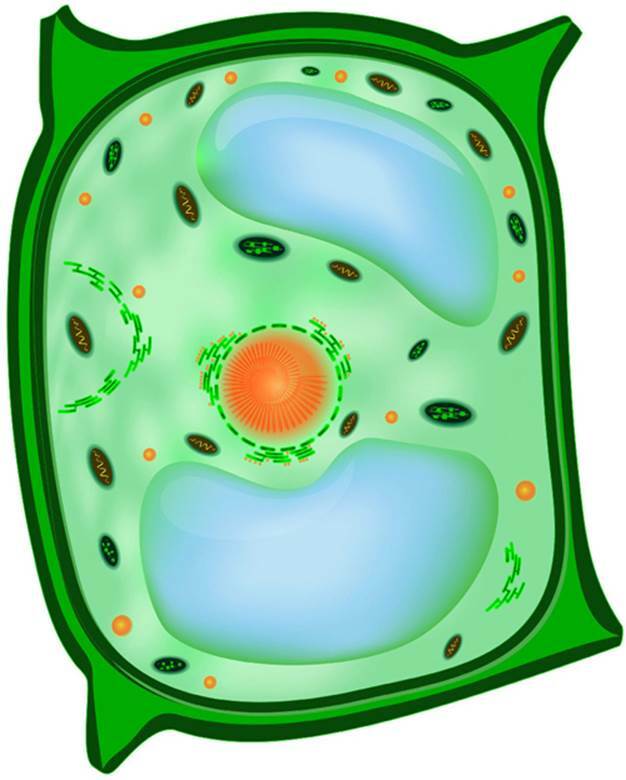 Unlike animal cells, plant cells have a cell wall.